After his 1st marathon (as an adult) in 2006, in which he was well beaten into 3rd place (2:06:35!) 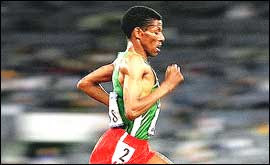 Haile Gebrselassie said, "I have to change a lot of things before I can become a good marathoner." One of these changes was to come off his forefoot to a more mid foot strike. He believed that the elastic sprinter-like stride (on the balls of his feet) he used to dominate on the track was not sufficiently energy efficient in the marathon.